Understand what division of labor is and why it is beneficial. Distinguish between vertical and horizontal linkages and know what functions each fulfills in an organizational structure. Jim Pattison Group offers a dizzying array of products and services, including grocery stores, lumber, and billboards. One way that the organization could produce its lumber would be to have individual employees cut up and finish one tree at a time from start to finish. This would be very inefficient, however, so the company and most other organizations avoid this approach. Instead, organizations rely on division of labor when creating their products (Figure 9.2 “The Building Blocks of Organizational Structure”). 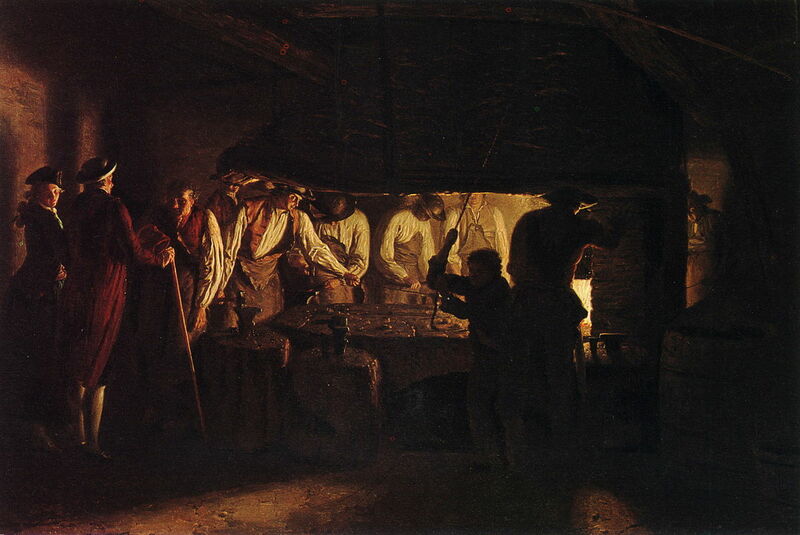 Division of labour is a process of splitting up a task (such as the creation of lightbulbs) into a series of smaller tasks, each of which is performed by a specialist. The leaders at the top of organizations have long known that division of labor can improve efficiency. Thousands of years ago, for example, Moses’s creation of a hierarchy of authority by delegating responsibility to other judges offered perhaps the earliest known example. In the 18th century, Adam Smith’s book The Wealth of Nations quantified the tremendous advantages that division of labor offered, using an example of a pin (nail) factory. If a worker performed all the various steps involved in making pins himself, he could make perhaps twenty pins per day. By breaking the process into eighteen separate steps, however, ten workers could make upwards of48,000 pins a day. In other words, the pin factory was a staggering 2,400 times more productive than it would have been without relying on division of labor. 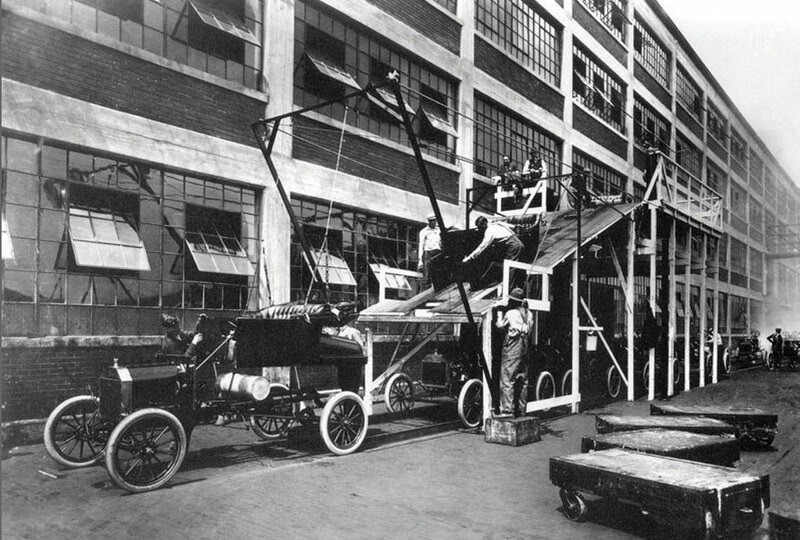 In the early 20th century, Smith’s ideas strongly influenced Henry Ford and other industrial pioneers who sought to create efficient organizations. Figure 9.3: Division of labour allowed eighteenth-century pin factories to dramatically increase their efficiency. While division of labour fuels efficiency, it also creates a challenge—figuring out how to coordinate different tasks and the people who perform them. The solution is an organizational structure, which defines how tasks are assigned and grouped together with formal reporting relationships. Creating a structure that effectively coordinates a firm’s activities increases the firm’s likelihood of success. Meanwhile, a structure that does not match well with a firm’s needs undermines the firm’s chances of prosperity. Most organizations use a diagram called an organizational chart to visually depict their structure. These organizational charts show how firms’ structures are built using two basic building blocks: vertical linkages and horizontal linkages. Vertical linkages tie supervisors and subordinates together. These linkages show the lines of responsibility through which a supervisor delegates authority to subordinates, oversees their activities, evaluates their performance, and guides them toward improvement when necessary. Every supervisor except for the person at the very top of the organization chart also serves as a subordinate to someone else. In the typical business school, for example, a department chair supervises a set of professors. The department chair in turn is a subordinate of the dean. Most executives rely on the unity of command principle when mapping out the vertical linkages in an organizational structure. This principle states that each person should only report directly to one supervisor. If employees have multiple bosses, they may receive conflicting guidance about priorities and how to do their jobs. The unity of command principle helps organizations to avoid such confusion. In the case of Jim Pattison Group, for example, the head of the Media division reports only to the president. If problems were to arise with executing the strategic move—such as joining the AMC Billboard group with the Media division—the president would look to the chief executive officer for guidance and accountability. Horizontal linkages are relationships between equals in an organization. Operationally, such linkages take the form of committees, task forces, and teams, and in fact are where the majority of organizational decisions are first considered for their cross-departmental or overall impact. Horizontal linkages are also important when close coordination is needed across different segments of an organization. For example, most business schools revise their undergraduate curriculum every five or so years to ensure that students are receiving an education that matches the needs of current business conditions. Typically, a committee consisting of at least one professor from every academic area (such as management, marketing, accounting, and finance) is appointed to perform this task. This approach helps ensure that all aspects of business are represented appropriately in the new curriculum. 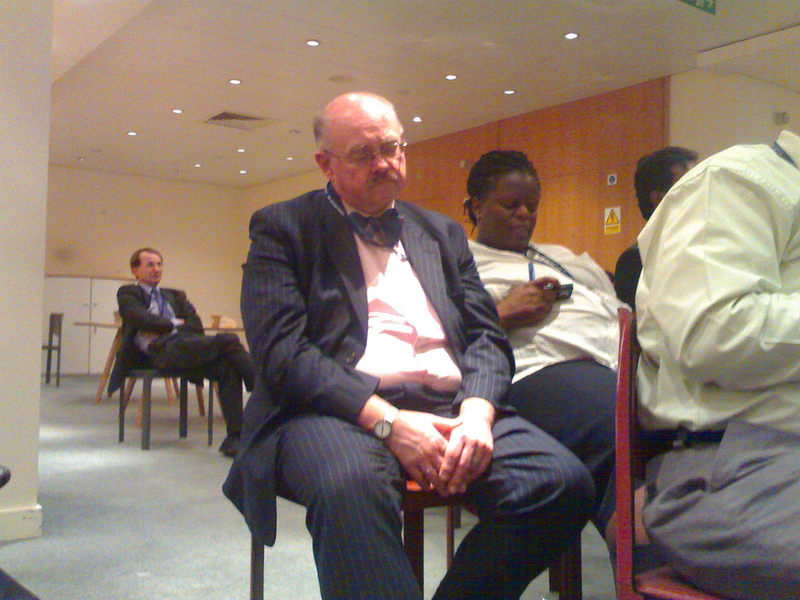 Figure 9.5: Committee meetings can be boring, but they are often vital for coordinating efforts across departments. Organic grocery store chain Whole Foods Market is a company that relies heavily on horizontal linkages. As noted on their website, “At Whole Foods Market we recognize the importance of smaller tribal groupings to maximize familiarity and trust. We organize our stores and company into a variety of interlocking teams. Most teams have between 6 and 100 Team Members and the larger teams are divided further into a variety of sub-teams. The leaders of each team are also members of the Store Leadership Team and the Store Team Leaders are members of the Regional Leadership Team. This interlocking team structure continues all the way upwards to the Executive Team at the highest level of the company” (Mackey, 2010). This emphasis on teams is intended to develop trust throughout the organization, as well as to make full use of the talents and creativity possessed by every employee. Informal linkages refer to unofficial relationships such as personal friendships, rivalries, and politics. In the long-running comedy series The Simpsons, Homer Simpson is a low-level—and very low-performing—employee at a nuclear power plant. In one episode, Homer gains power and influence with the plant’s owner, Montgomery Burns, which far exceeds Homer’s meager position in the organization chart, because Mr. Burns desperately wants to be a member of the bowling team that Homer captains. Homer tries to use his newfound influence for his own personal gain and naturally the organization as a whole suffers. Informal linkages such as this one do not appear in organizational charts, but they nevertheless can have (and often do have) a significant influence on how firms operate. The concept of division of labor (dividing organizational activities into smaller tasks) lies at the heart of the study of organizational structure. Understanding vertical, horizontal, and informal linkages helps managers to organize better the different individuals and job functions within a firm. How is division of labor used when training college or university football teams? Do you think you could use a different division of labor and achieve more efficiency? What are some formal and informal linkages that you have encountered at your college or university? 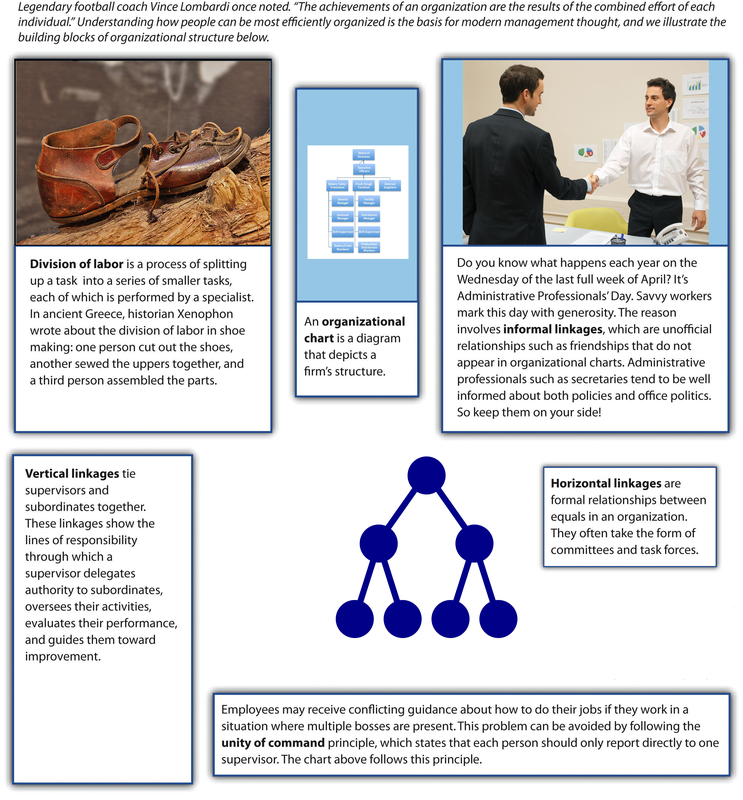 What informal linkages have you observed in the workplace? The Basic Building Blocks of Organizational Structure by Janice Edwards is licensed under a Creative Commons Attribution-NonCommercial-ShareAlike 4.0 International License, except where otherwise noted.